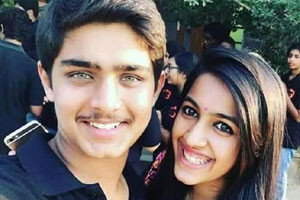 Here is a cute photograph of Mega daughter Niharika striking a pose with actor Srikanth’s son Roshan. The young duo seems to be having good acquaintance given how close Srikanth is to Mega family. Roshan made his debut as lead hero last year with ‘Nirmala Convent’, which unfortunately couldnt become a perfect launchpad for the teenager. Niharika too faced humiliation with her debut film ‘Oka Manasu’. She is reportedly acting alongside Vijay Sethupathi in her Tamil debut film. The two star kids hope to make perfect comeback with their upcoming films.